My latest travels across India like the ‘Jewellery Travel With Elena Veselaya‘ have made me understand Indian jewellery a bit more holistically. And, also helped me understand fine quality and innovative designs. 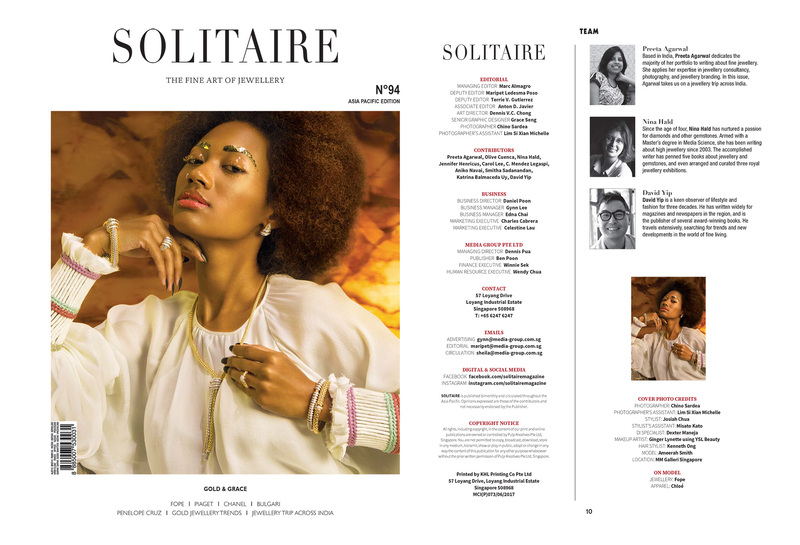 When asked by the Solitaire editor to pick my favorites, one each from four of India’s top cities, I chose a combination of legacy, innovation and diversity. So, below is my list of four top Indian jewellers one should definitely visit if your are traveling to Jaipur, New Delhi, Mumbai and Bengaluru. 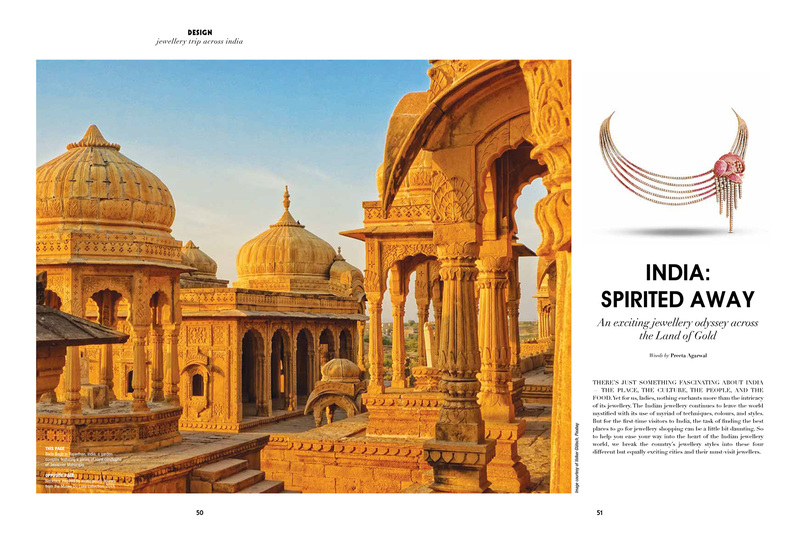 The story ‘India: Spirited Away’ is written for the April – May 2018 issue of Solitaire Singapore. An exciting jewellery odyssey across the Land of Gold. THERE’S JUST SOMETHING FASCINATING ABOUT INDIA — THE PLACE, THE CULTURE, THE PEOPLE, AND THE FOOD. Yet for us, ladies, nothing enchants more than the intricacy of its jewellery. The Indian jewellery continues to leave the world mystified with its use of myriad of techniques, colours, and styles. But for the first-time visitors to India, the task of finding the best places to go for jewellery shopping can be a little bit daunting. So to help you ease your way into the heart of the Indian jewellery world, we break the country’s jewellery styles into these four different but equally exciting cities and their must-visit jewellers. The first stop in India for most jewellery lovers is the Pink City, Jaipur. Known for its heritage jewellery craft, Jaipur is famous for kundan- polki (uncut diamond set with 22K gold foil) and meenakari (enamel) jewellery. With streets full of jewellers, it is almost mandatory to decide on one brand that will give you a variety to choose from all under one roof. And if you’re looking for one that truly reflects the Indian aesthetics with a modern twist, then Amrapali is for you. In 1994, Amrapali’s iconic Paanch Batti store was opened in the heart of the city, which has now become an international landmark in itself. The showroom is spread on two floors, showcasing handcrafted jewellery that fit all occasions, ranging from everyday pieces to exclusive bridal and festive jewellery, along with Indian tribal silvers and antique temple jewellery. Set with multiple-coloured gemstones, Amrapali’s pieces have a distinct design language, honed over the years by the founder Rajesh Ajmera and Rajiv Arora, and now being harnessed by the next generation scion, Tarang Arora. With multiple showrooms across the globe, the Amrapali jewellery are favoured on the red carpets, from Bollywood to Hollywood. A little towards the East from the sandy deserts of Rajasthan is New Delhi, the capital of India and a city heavily influenced by its wealthy neighbouring states. Undoubtedly in this city, just like in most cities in the world, jewellery is often a measure of a person’s stature in the society. The choices widely vary from a bit over-the-top to the everyday-wear, to the grand bridal pieces. A jewellery landmark that has stood the test of time in Delhi is the Hazoorilal Jewellers showroom in the city’s plush Greater Kailash market. The 65-year-old jewellery house founded by Hazoorilal Narang, opened its doors at this prestigious address over three decades ago and has since served generations of Northern India’s elite. Known for their unending inventory, one can expect to find almost everything at the showroom, in terms of gold and diamond-set jewellery, from the serious classics to the most flamboyant of jewellery pieces. Now managed by one of the sons, Sandeep, the jewellery house has recently undergone a state-of-the-art revamp and now presents itself as ‘Hazoorilal by Sandeep Narang’. From Delhi, we move down towards Mumbai, the fashion capital of India. More understated, Mumbai is all about effortless fashion. With a heavy influence from the residence of the entire Bollywood industry, Mumbai’s elite often gets first dibs on international fashion, experimenting on new looks every season. Zoya, the exquisite diamond boutique from the House of Tata is a fine jewellery brand renowned for its theme-based kundan-polki and brilliant-cut collections. Unique inspirations from history, culture, art, and legends are translated into one-of-a-kind designs by its panel of master craftsmen, under the guidance of their principal designer Sangeeta Dewan. Retailing by the high standards set by the Tata group, Zoya, a relatively new entrant in the industry, with just eight years of operations, has managed to mark a position for itself in the shopping lists of Mumbai’s fashion elite. Designed more like an exclusive gallery of fine jewellery, Zoya’s Mumbai boutique is famous for its window displays, featuring mix-media and colourful props. Moving further south, the lifestyle is more simple and ritualistic. Bengaluru, the country’s technology hub, has the money to indulge in high jewellery, with its tastes refined by constant exposure to international jewellery trends. Emphasis is laid on the quality of materials used rather than the size of the jewellery. 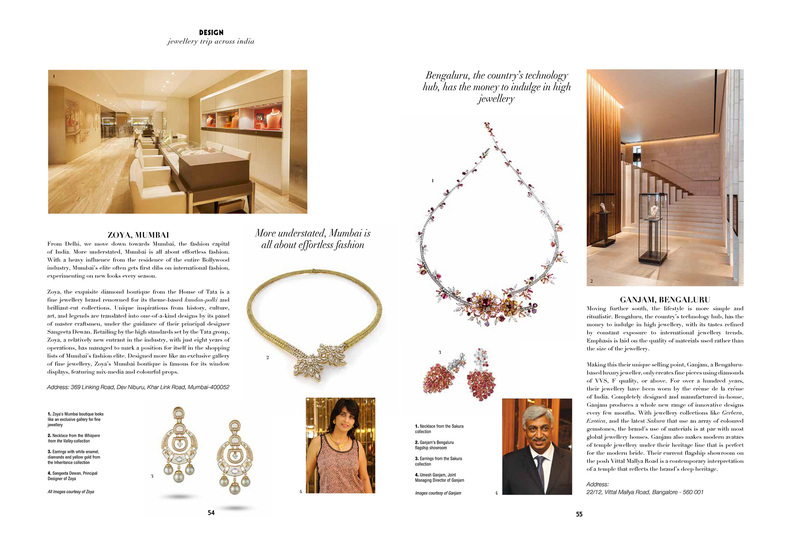 Making this their unique selling point, Ganjam, a Bengaluru- based luxury jeweller, only creates fine pieces using diamonds of VVS, F quality, or above. For over a hundred years, their jewellery have been worn by the crème de la créme of India. Completely designed and manufactured in-house, Ganjam produces a whole new range of innovative designs every few months. With jewellery collections like Gerbera, Exotica, and the latest Sakura that use an array of coloured gemstones, the brand’s use of materials is at par with most global jewellery houses. Ganjam also makes modern avatars of temple jewellery under their heritage line that is perfect for the modern bride. Their current flagship showroom on the posh Vittal Mallya Road is a contemporary interpretation of a temple that reflects the brand’s deep heritage.